Editor: Thursday June 15th, well-known OBcean Claudia Jack is giving a presentation on her collection of historic OB Signs. This is being hosted by the OB Historical Society and will be at 7pm at the Point Loma United Methodist Church, 1984 Sunset Cliffs Blvd., in O.B. The following is an article on Claudia originally published in February 2015. Claudia Jack – a venerable fixture in a “who’s-who” of the people who make OB run – is definitely THE “Go-to-Woman” of Ocean Beach. If you need something, somebody, or have a question or issue about OB, Claudia’s the woman to see. It was just a couple of months ago that the OB Town Council presented her with their Lifetime Achievement Award for 2014. Finally catching up with her last Wednesday as she sat in a chair almost in the middle of Newport Avenue, I grabbed a metal folding chair next to her, got out my (paper) tablet and pen and for the next hour or so quizzed Claudia on who she is and what she does. It was a Farmers Market day and that block of Newport is closed down to traffic and canopies and the aroma of foods take over. And while we sat there, Claudia helped to operate the Farmers Market, providing David, the market’s manager with an invaluable assistant. We must have been interrupted at least ten times by visitors, locals, market staff, and other volunteers during the interview, all querying Jack on the finer points of running the weekly event in OB’s principle commercial street. 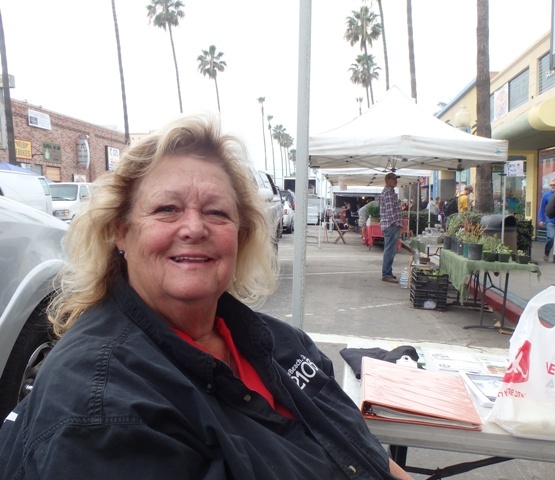 Claudia has been running OB’s Farmers Market for over 15 years and she still loves it, it’s plain to see. Everybody knows Claudia as OB’s chief volunteer – but not everybody knows her personal history – and it is amazing once she tells the story. And right off the bat, I was blown away – as I was certain that she was almost 10 years younger than me – but not true – she’s actually older. Claudia was born in Linda Vista to Raymond and Jessie Peters. Her dad was very tall – standing at 6 feet 8 inches. He became a tool engineer for Convair while Jessie ran the house and raised Claudia and her sister Glenna. Glenna passed away about 5 years ago. When Claudia was 4, the Peters bought an old Cape Cod cottage in Pacific Beach and lived there for 6 years or so. At some point, her dad was a lifeguard in Mission Beach and meantime Claudia was becoming enamored with beach life. In 1955 the family purchased a lot on Sunset Cliffs on Amiford Drive and moved in 2 years later. They stayed there for about 4 years, Claudia told me. “We had an ‘all-American’ family,” Claudia said, “with lots of traditions,” – traditions that partly came from the old country, as on dad’s side of the family, her grand-dad came from Germany and grandma from Switzerland, whereas her mom brought all her family traditions from the South. One strong tradition was volunteerism – and Claudia’s father got her involved in her first experience when she was 8 years old. And she’s been doing it ever since. Claudia attended Dana Jr. High and also Point Loma High, graduating in 1963. “I wasn’t a good student,” Claudia admitted, “I was always fighting, getting thrown out of school. I had no problem kicking people’s asses,” she said. 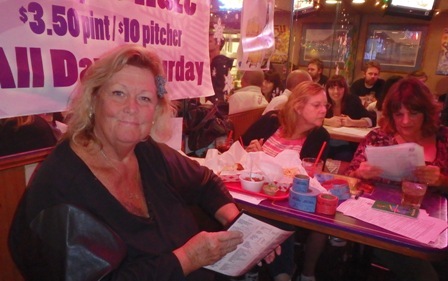 She also had a good side – she must have – as she said, “I still have friends from those days, through junior high.” She went to a PLHS re-union 7 years ago. At some point her parents split up, and she, her sister and mother moved to Ocean Beach. They had to move, Claudia recalls, whenever the rent was raised. In the mid-1960s, Claudia married a local man but they divorced early in the 1970s. Still in OB, she remarried – hooking up with John Guilmet – the man who would father her sons. They had Johnny in 1974 and then the twins Jimmie and Joey in 1975. And this is where Claudia’s story takes an amazing turn. What’s also amazing is her forthrightness about it all. It seems that in 1965, Claudia had a son out of wedlock – “my first son”, she said, as she later of course had more. Back in those days, a nasty stigma attached to such births, and she gave him up for adoption. Fast forward to two years ago. Her other oldest son, Johnny, was getting ready to be married and he decided that he wanted to find his “long-lost” brother. So he hired a detective – and against all the odds – actually was successful and found him living up in Sacramento with his own wife and family. 47 years later, Claudia meets her very first son, named Peter Lambert, who had been adopted by a Navy couple in 1965. Today, Claudia and her long lost son are inseparable, and Peter has been accepted by all the other sons. With a hint of moisture in her eye, Claudia quietly said, “last Mother’s Day, he called me ‘mom’ for the first time.” And last Christmas the entire family was together. Meanwhile, son Joey has a son Oliver, 1 1/2, lives in Virginia and works for the National Hockey League. Johnny lives in San Diego near San Diego State University, and Jimmie works for Delta Airlines and lives in Atlanta. Claudia divorced John in 1979 and married hubby number 3 – Jim Jack. Jim became close to her sons and the rest of her family. Even though they never divorced, they did separate. “We’ve very good friends,” Claudia said of Jim – whose name she still retains. They get together for holidays and birthdays. Our discussion morphed into what Claudia has been doing for work during her professional life over the years. After working at OB’s Yum Yum Donuts and other fastfood places, she became a cook for the Marines at MCRD in the mid-1970s. After 12 years there, she was an expert in corporate dining and became a cafeteria manager, first for the large defense contractor, SAIC, for 10 years, and then for Calliway Golf up in Encinitas for about 6 years. Finally she worked for OB’s own Dave Martin, current owner of Shades, when he was a KFC manager. She did this for 3 years and left in 2000. That same year the OB Mainstreet Association hired her. She had been volunteering with them already, so now she gets paid for the things she does – or at least some of them, as she does so many things. One of her main areas of duties for the OBMA, of course, is OB’s Farmers Market. “We’re certified,” Claudia must have told me three times over the course of our talk. Obviously, she’s very proud of the market and her work for it. 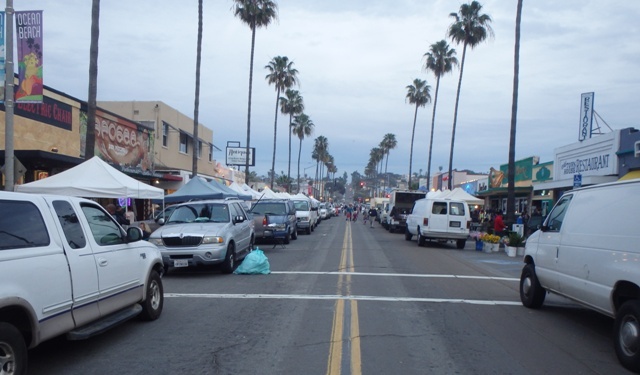 Every Wednesday afternoon, the market’s vendors set up on one block of Newport – usually about 110 booths a week during the slow season, like now, and goes up to over 120 during the summer months. Officially, Claudia works 34 hours a week for the OBMA, as the office assistant, answering phones, greeting tourists and locals alike when they come into the organization’s office on Bacon Street, a half block off of Newport. Monday through Friday, 10 to 4, that’s where you’ll find her. But unofficially, she’s all over the place. She volunteers for the OB Town Council, doing the craft fairs (9 of them last year), she brings the OB Christmas Tree to town, arranging for one, dealing with the crane and everything in between. She helps with the annual OBTC Christmas Auction which raises thousands of dollars as part of the Food and Toy Drive every year. She also has her own consulting business, “OB Services” that does special events all over San Diego, trash and clean-ups. Some of her events call for her to have 10 to 12 people working for her. She also manages the “OB Hot Line” – that people call and leave messages for her with questions – she always calls back, like ‘what buses are running’, ‘what’s open on the holidays’, ‘when are the clean-ups’. She gets about 5 to 10 calls a week. Ocean Beach is not the only place where Claudia does her volunteer time. She was just named the “2014 Irish Woman of the Year” by the Irish Congress of Southern California for all her work with them. The list is too long to cite here, but chief among them are being the Board Chair for the Irish Congress, and in charge of the Irish Festival in Balboa Park. Winding down, I asked Claudia what she’d like to see in OB. We started to get nostalgic. I asked her about her old OB memories. 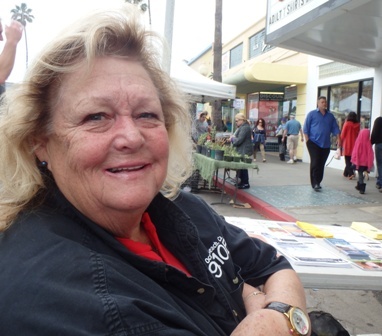 “Loved watching the surf classic,” she said, the Surf Championship held in OB in 1966. She knew a lot of the old surfers, she knew “Mousey”, Judy Dibble – they were tandem surfer partners. She knew “the Spaceman of OB”. “I have a photographic memory,” she said. Okay, I said, pressing her on her memories, “what was your Space Number?” Space Numbers were given out by Spaceman – so once the aliens arrived, those with space numbers would be saved. Claudia Jack is authentic OB. If you want something or need somebody, she’s the “go-to-woman” for Ocean Beach. What a wonderful writeup, Frank, about this unique OB no. 010. I stopped by the office a couple days ago with a picture for the BEACON and she referred me to the PB office no. It’s always nice to see her sitting right as you come into the office.